Eeee! Are you getting excited for Rhinebeck? I certainly am. David and I will be there the whole weekend, with the usual cast of characters. See you there? You’ll probably see me pretending to resist as Amy drags me into the fleece barn. You might recognize me by the old sweaters I’ll be wearing, since I didn’t manage a new Rhinebeck Sweater this year. 2 out of 3 ain’t bad, right? 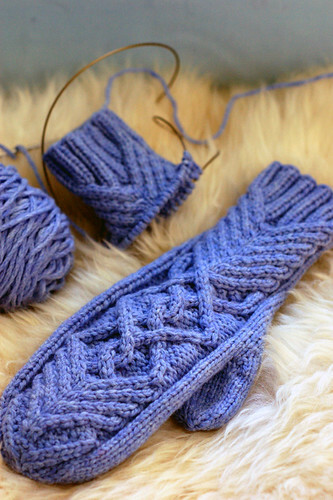 Pattern: Chevalier Mittens (Ravelry link) by Mari Miunonen of MadeByMyself. It’s free! The Cork is producing a very firm fabric, which is perfect for mittens. They’re scrumptious! They’d be done if I hadn’t made two right mittens. You’d think I’d know better. As for shop updates and Fiddlehead kits- ugh. It turned out there was a lot of electrical work, in addition to plumbing, that needed to get done so that my dye studio was functional. It’s being finished up today, finally. We moved from an area with tradespeople galore to an area with very few. It’s been an exercise in patience getting all this work done. Thanks for your patience, as well! If you blinked, you missed the fiber club subscription sale. I didn’t even get a chance to blog about it. The slots were gone as soon as I put them up. I will be adding a self-sign-up waiting list for the club slots to the website at some point soon. I think a waiting list will be a lot less stressful for everyone than the mad dashes that happen every time. I’m not taking names right now. I’ll put the sign-up form up and post about it here when it happens. See you at the Ravelry party at Rhinebeck!